This year has to be one of the most anticipated Blizzcons ever. Not only will there be a playable version of Wrath of the Lich King, but we’ll more than likely see the WotLK opening cinematic, but we’ll more than likely get updates on Starcraft II and Diablo III. With all this anticipation, many people tried to get tickets on August 11 when the Blizzard Store started selling tickets. Nobody was able to get tickets, and the store had become slow, then started spitting out errors just as people were confirming their purchases, and then the site went dead altogether. Blizzard announced that nobody had been able to buy tickets when the store opened and that it would be brought up as soon as possible. In what was probably the biggest spammng of “refresh” in the history of the internet, people kept trying the Blizzard Store, hoping to get their tickets before people realized that the store was back up. Slowly, the site came back up, and went back down. Over and over again, the store teased people into believing that tickets were available, only to pull the rug out from under them. People were finally reporting that they were able to buy tickets and got their confirmation emails. 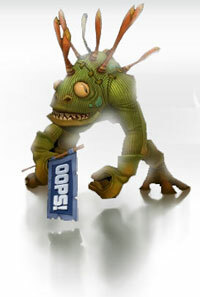 Other people reported clicking the last button they had to, only to be brought to the Murloc Error Page, leaving the user to try again. This is where the story takes a nasty turn. Those people that did try again found that they were charged multiple times for their purchases. What this means was that the store’s server marked the transaction complete, but returned an error to the user. The user would naturally believe that the transaction didn’t go through and tried again. One person even reported being charged 30 times for a total of $3000! The problems didn’t end there. Towards the end of the afternoon, people found they had 1 or more tickets in their cart, they go to check out, and get an error that the tickets were no longer in their cart and that there were no more tickets available. Ticket sites like ticketmaster.com will “hold” the tickets for you for a few minutes. I’ve seen it average at 3 minutes. This reserves those seats for you for that session for three minutes and the tickets stay in your cart for that time. With the Blizzard Store, even though the tickets were in your cart, they weren’t held for your sessions like ticketmaster.com does. Needless to say, this caused a lot of people to complain that Blizzard shouldn’t have done that, and I would have to agree with that feeling. If something’s in your cart, the electronic store shouldn’t take the items away from you on a whim. Afterwards, Blizzard announced that there was still a block of tickets left and will be sold at 8PM PST. Were these “reserve” tickets from the multiple transactions people saw earlier? I haven’t found any evidence to say whether or not they were. The server went down about 2 minutes before, and came back up about 1 minute after the hour. Some people were able to snag tickets, others saw the tickets in their cart disappear as the tickets were listed as “sold out” again. This leads me to the conclusion that Blizzard should not have handled the ticketing themselves. It should have been handed off to a system that has the capability of handling this kind of scenario. Don’t think for a minute that ticketmaster.com couldn’t have handled it. When thousands of people are trying to snag Springsteen tickets in the NJ/NY area and the site manages to do reasonably well, 12,000 Blizzcon tickets would have been a joke to the ticketmaster servers. I would have gladly paid an extra $5 for a ticket if it meant a smoother transaction for myself and others involved. I hope in the future that Blizzard does a better job at handling this kind of scenario. Several good people from my raiding guild aren’t going because of this mess and it’s a shame because they’re some of the best players in the game. It was a pretty demoralizing 2-day experience. I was one of those who had tickets in my cart and made it all the way to the confirm page over 2 dozen times, only to get error screens on the last step. I don’t mind getting shutout for tickets to an event. Living in LA and being a music fan, it’s happened a lot, but not like this. They should have either contracted out the ticket sales or down a pre-sale lottery like was done for the Led Zeppelin show in London last year. It’s not unreasonable for a user to assume that when they’re on a confirmation page of a mulit-step checkout that they’ll be able to complete it. To set up a system that made it a crap shoot at the end is profoundly stupid. What was worse than the actual experience was Blizzard’s almost total lack of communication about what was going on. There were hours between blue posts in the forums, and late in the process, the front page of Blizzard’s site and the Blizzcon site, both pointed to a forum post that was rarely updated. They did, however, spend a lot of time deleting threads that quickly exploded as furious users posted their experiences. This was not a case of QQing by the users—the system that Blizzard had set up was fatally flawed and the deserve the excoriation they got. I wish I could be there–I’d love to look at all the name badges, because I have a feeling that a good number are “asd;fha d;lgkh” or the like, since that’s probably how many of those that got through the process did it. I wish they would have used a third party service. I spent many hours waiting to try to get one. grr.. Initially I was impressed by the front page updates and that they kept some tickets for later so people presumably at work could have a chance of getting a ticket. But after reading this I have to agree that they should get a 3rd party to handle the sales in the future. This is so similar to the Apple fiasco I wonder just what goes through these companies’ minds sometimes. I think this should be a big wake up call for companies trying to utilise the best of what the web has to offer, that they can’t do ‘everything’ and that when they try to make a big splash they should be aware that a lot of their customers are more web wise and will be trying to access the systems all at the same time. That said, Blizzcon tickets have always been a huge hassle and not just Blizzard but customers should have known it would end in tears. Clearly Blizzard needs to exit the e-commerce business. Smart business people know what they’re good at, and pay other people/businesses to handle what they can’t do. This was pure greed and arrogance on the part of Blizzard. Yeah this whole thing was pretty much a disaster. Blizzard’s store wasn’t up to the load. I think I understand why the did it the way this did (using their store), but it was a disaster. They should have stress tested the server fully before they set this live, but they didn’t. Seems that Blizzard has offered an apology and will be giving away 3000 more tickets through lottery.